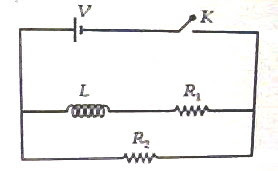 The emf induced in the sliding connector PQ is ε = Blv, which is shown as a battery of internal resistance R in the adjoining figure. Therefore, I = ε/(3R/2) = 2Blv/3R. The current I gets divided equally between the two identical branches and hence I1 = I2 = Blv/3R. Therefore, at the instant t = 0 the current is limited by R2 alone and is equal to V/R2. 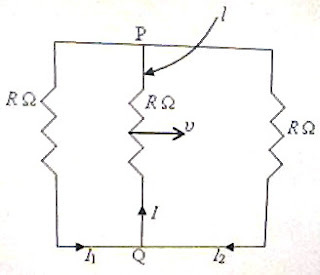 At t = ∞ the current has become steady, there is no induced voltage to oppose the flow of current and the inductor functions as a piece of conductor. The current is now limited by R1 and R2 which are in parallel with the battery. 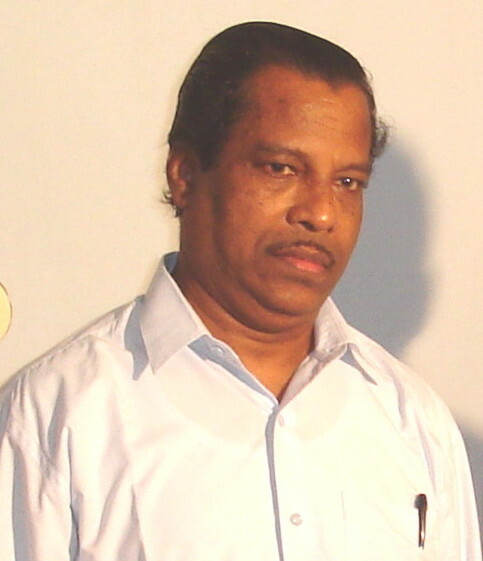 The current in this case is V/[R1R2/(R1 + R2)] = V(R1 + R2)/R1R2, as given in option (3). You will find similar useful multiple choice question (with solution) here. 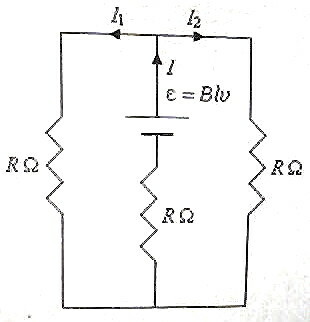 Av = – βac(Ro/Ri) where βac is the a.c. current gain, Ro is the output resistance and Ri is the intput resistance. (Instead of Ro and Ri you may use Zo and Zi, the respective impedances). 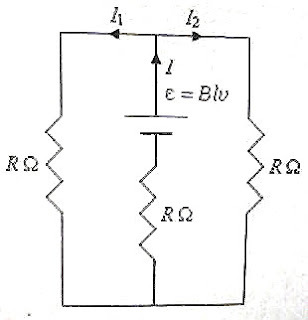 The negative sign just indicates the 180º phase shift of the output signal with respect to the input signal. Therefore we have 50 = βac×200/100 from which βac = 25. Power gain = current gain×voltage gain = 25×50 = 1250. (2) Which one of the following bonds produces a solid that reflects light in the visible region and whose electrical conductivity decreases with temperature and has high melting point? This is a very simple question and the answer is metallic bonding. This too is a very simple question and the answer is integrated circuit. (4) Which one of the following statement is FALSE ? The FALSE statement is given in option (3). I would never die for my belief because I might be wrong. Two questions on gravitation were included in the IIT-JEE 2010 question paper. They are given below with solution. The first question is a ‘single correct choice type’ (single answer type multiple choice) question where as the second question is an ‘integer type’ question which has a single digit integer ranging from 0 to 9 as answer. The work required to take a unit mass from infinity to point P is the gravitational potential at P and it will be negative. Therefore, the work required to take a unit mass from point P to infinity will be numerically equal to the gravitational potential at P but it will be positive. 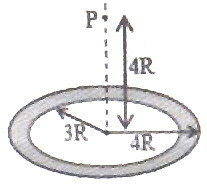 The negative sign is to be dispensed with to obtain the work required to take a unit mass from point P to infinity and the correct choice is (2GM/7R) (4√2 – 5). [This is is an ‘integer type’ question. You have to work out this question and the single digit integer answer is to be shown in the Objective Response Sheet (ORS) by darkening the appropriate bubble]. We have vesc = √(2gR) where g is the acceleration due to gravity and R is the radius of the planet (or earth or star). g = G[(4/3)πR3ρ] /R2 where ρ is the average mass density of the planet (or earth or star). Therefore g α Rρ and gp/ge = (Rp/Re)(ρp/ρe). From this Rp/Re = (gp/ge)/(ρp/ρe). The answer integer is 3. 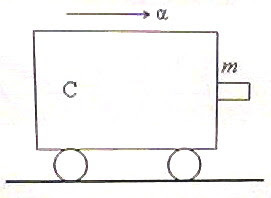 When the cart moves forwards with acceleration α, the block of mass m presses against the vertical surface of the cart with a horizontal force of magnitude mα. Therefore, the normal force acting on the block is mα and the maximum frictional force trying to prevent the block from falling is μmα. This must be greater than or equal to the weight mg of the block.